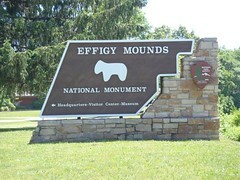 We ended up slightly disappointed at Effigy Mounds because I had heard they had an accessible trail, but failed to really research it to know what the trail took you to see. The trail is a nice accessible trail, but it just takes you down to the Yellow River and does not involve seeing the Effigy Mounds. 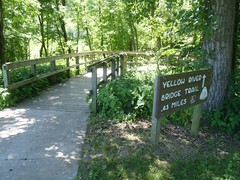 The trail from the Visitor Center that goes to the mounds starts out with a little section of boardwalk that is accessible, but it only goes to a group of three mounds. In order to see any of the real Effigy style mounds you have to go on a trail that is dirt and bark. It looks potentially doable, but it is at least 2 miles to see any of the Effigy mounds and it started with uphill. Mik certainly was not feeling adventurous enough to try it despite Dad being willing after the Circle Trail incident at Pipestone National Monument a few days earlier. The Visitor Center is nice and they do show a good movie that lets you be able to get an idea of what the Effigy Mounds look like. It also has a little museum about the Native American cultures of the region and mound building. We were also happy they had the 25th Anniversary National Park Passport stamp, which not all the places that have the stampers have. I still enjoyed the Effigy Mounds National Monument, but Mik was kind of disappointed by the promise of an accessible trail and it ending up not featuring the main thing the National Monument protects. However, he did like the trail and getting to go on a hike without it being so bumpy or ever having to flip his front wheels up. Of course, about a week later he got a Free Wheel at the Abilities Expo and now wants to go back to the trail he could not do.